This is one of my mum's favourite recipes and when I was growing up we used to eat it at least once a fortnight! As a child I found the okra too bitter but these days I don't notice any bitterness at all. Now that the Christmas and new year festivities are finally over, I thought it would be a good, low fat, dish to include for those of us that are trying to burn off the extra inches gained in the last couple of months. The recipes for the next few weeks will be of a similarly healthy variety - at least until I have forgotten all of my festive food sins! Wash the okra and then dry well with a tea towel. Leave them on the side to dry out further. This step will prevent the okra from becoming sticky whilst cooking. Heat the oil in a pan on a lowish heat and then add the cumin seeds and fenugreek. Let them sizzle and fry for a minute. Add the onion and cook until it is transparent. Now add the garlic, ginger, chilli powder, turmeric powder, coriander-cumin powder, green chilli and salt. Stir well and let it cook for 2-3 minutes. Add the potatoes and water. After stirring, place the lid on the pan and let it cook for 10 minutes. While the potatoes are cooking, cut the stalks off the okra and then chop them widthways (to create 1 cm thick flower shapes). 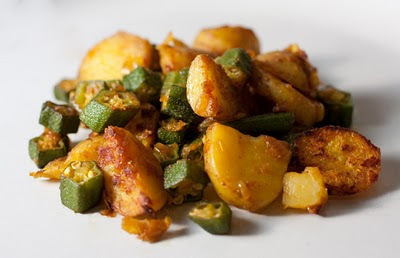 After the potatoes have cooked for 10 minutes, add the okra to the pan and stir well. Put the lid back on the pan and let everything cook for 2-3 minutes. Now remove the lid, stir well, turn up the heat a little and let the okra and potatoes continue to cook. The dish is ready when the potatoes are cooked and the okra are to your taste; I prefer them to be dry and crispy, others prefer them to be softer. If you aren't sure, then just keep tasting it until it is right for you - after all one of the joys of being the chef is that you will never go hungry! If you are trying to crisp them, and it isn't happening for you, add a teaspoon of oil and stir. Serve immediately with salad and bread. Hi Reena, this recipe looks fantastic! I work for a dietitian (Lauren Antonucci of Nutrition Energy in NYC) and we are looking for okra recipes that require no frying and are not paired with tomatoes. This is for some of our patients who have Gastrointestinal troubles. We love your recipe and we want to feature it in our monthly newsletter if that is ok with you. We will credit and site your work. Love this! Thank you for sharing such a cozy yet healthy recipe for us!